It’s important to know which grilling method to use for your next barbecue meal: direct, indirect or a combination of both grilling methods. It doesn’t matter what kind of grill you have – you can use any grilling method on both gas and charcoal grills. 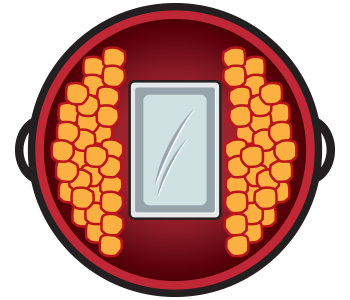 You’ll be able to deliver direct or indirect heat to your food by arranging your coals in different patterns on your charcoal kettle grill or by selectively turning on your gas grill’s burners.On a charcoal grill, you can deliver direct or indirect heat to your food by arranging your coals in different patterns. If you’re using a gas grill, all you have to do is selectively turn on your gas grill’s burners. 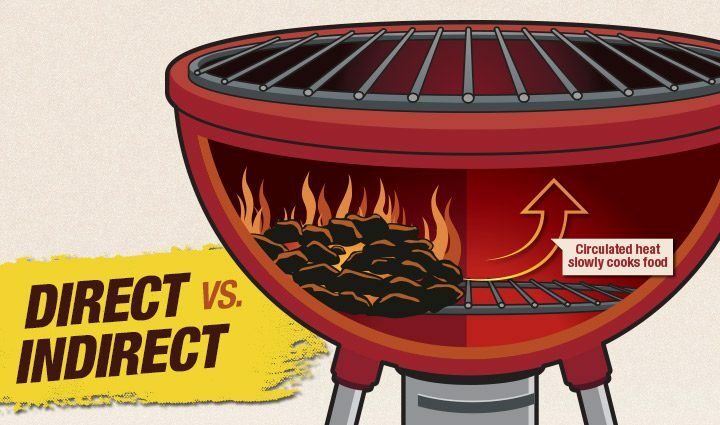 What’s the Difference between Direct and Indirect Heat Grilling Methods? There are two different grilling methods you can use to deliver heat to your food on your grill: direct or indirect heat. The difference between the two methods is how they deliver the heat to your food. For food that tastes better when it’s seared on the exterior with a juicy interior, it’s a good idea to use a combination of the two grilling methods. Direct heat grilling is similar to broiling, where you cook the food directly over the heat source. Since the food is directly exposed to the fire, the direct grilling method can help you create those perfect grill marks. Remember to turn your food once halfway through the grilling time so your food gets cooked evenly. Use the direct heat grilling method for food that takes less than 25 minutes to cook. 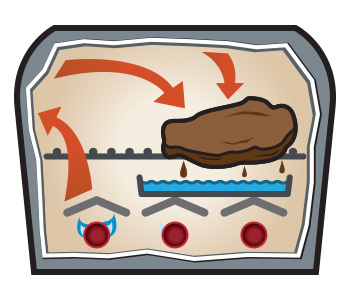 Your food must be turned halfway through its cooking time to expose both sides to heat. Direct heat grilling is perfect for food such as hamburgers, vegetables and shrimps. Indirect heat grilling is similar to roasting, but with the added benefit of that delicious texture, flavor, and appearance that you can only achieve on a grill. When the heat from your grill rises, it reflects off the lid and the grill’s surfaces to slowly cook your food evenly on all sides. The circulated heat works like an oven, and your food does not need to be turned because of the slow cooking process. Since indirect heat is created by reflected heat, this method only works when your grill is covered. Try to avoid peeking at your meal when you are using the indirect grilling method since heat will escape every time you lift the lid and your meal will take longer to cook. Since indirect heat is created by reflected heat, this method only works when your grill is covered. Try to avoid peeking at your meal when you are using the indirect grilling method since every time you lift the lid, heat will escape, as result your meal will take longer to cook. Use indirect grilling method for food that’s either delicate or takes a long time to cook. Indirect heat grilling perfect for food such as ribs, whole chickens and fish. 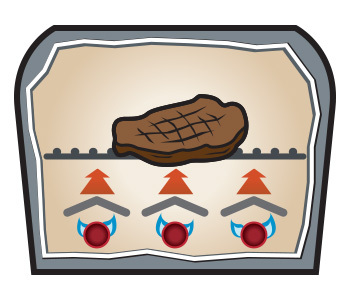 Combination heat grilling uses a combination of both direct and indirect methods. The food is seared over direct high heat for a few minutes, then cooked to finish over indirect heat. Use the combination grilling method for food that tastes better when it has a crispy, caramelized exterior and a tender interior. Combination heat grilling is perfect for food such as steak and pizza. When you’re using a charcoal grill, the secret to delivering direct or indirect grilling is to properly arrange your charcoals. Before you begin grilling on a charcoal kettle grill, prepare and light the charcoal in a chimney starter and let it sit for 20 minutes. Once the charcoals are hot enough, you can arrange them in different setups. setups. Don’t forget to check to see if there is enough charcoal every hour to keep the fire burning and to maintain an even cooking temperature. Spread the coal evenly on your charcoal grill’s charcoal grate. This arrangement allows you to use the entire grilling area for direct heat grilling. The two zone heating method is the most commonly used and most versatile charcoal arrangement setup. With this setup, the charcoals cover half of the charcoal grill while leaving the other half empty. This setup leaves you with half of the grill using direct heat for searing and the other half for slowly cooking meals over indirect heat. Perfect for: Steaks, pork chops, boneless chicken, seafood, veggies and desserts. With this method, the coals are spread on either side of the grill, leaving the middle of your grill empty to use for indirect heat. For a quick and easy three zone setup, you can purchase a charcoal briquet holder. Perfect for: Larger roasts and thicker cuts of meat. Place your coals in a circle around the edges of your charcoal grate. 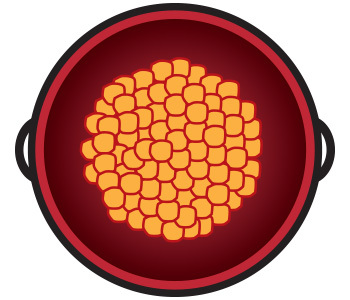 Arranging your coals around the perimeter will provide direct heat while the center of the ring provides an area of indirect heat. This setup is typically used for “smoking” your meat. To add flavor to your food, add in some hardwood chips with your coals. Always soak the wood chips for 30 to 60 minutes before adding them to your grill, otherwise they’ll burn too quickly. The biggest disadvantage to this charcoal arrangement setup is that it’s very time-consuming to position the coals in a circle formation. Perfect for: Adding a smoky taste. Set up the coals with the three zone setup. 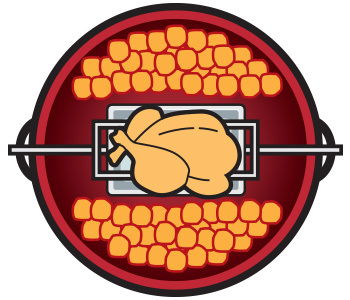 Then set up your chicken, turkey or larger roasting meat using a rotisserie kit. Most people think that zone cooking can only be done on a charcoal kettle grill, but you can easily set up heat zones on your gas grill as well. Setting up your gas grill for direct and/or indirect grilling is actually simpler than setting up a charcoal grill. Grilling Tip: It’s always a good idea to preheat the entire grill so it burns off any remaining residue from when you grilled last. 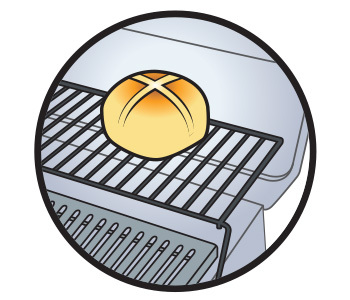 Preheat your grill to 500°F (260°C), close the lid and turn all burners to “high”. Then using a brass-bristle grill brush, thoroughly brush your cooking grates until they are free from any build-up. If you don’t have a brass-bristle grill brush, you can try cleaning your grill’s cooking grates with an onion. Turn the burner “on” using the control panel located right underneath the food you are grilling. Two Zone — Turn the burner “on” using the control panel that’s furthest from the food you are grilling. Leave the burner that’s right underneath your food set to “off”. 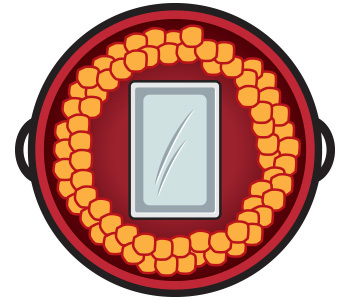 Three Zone — Turn on the two side burners and leave the burner in the middle off. You can also use your warming rack for indirect heat. The warming rack helps keep any cooked food warm or to absorb extra smoke. It’s also great for heating up buns! The water helps keep the food moist during indirect cooking as prolonged cooking can dry out the meat. You can also experiment with beer, wine, or cider mixtures or any marinades to add smoke flavoring to your meat. The drip pan also collects all the fat and grease from your meat and prevents it from dripping onto your grill as grease buildup can damage your grill’s parts. It can also help you clean up faster. You can also provide indirect heat to your food by using barbecue grilling accessories that create a barrier between your cooking grates and the food, such as a wood grilling plank or pizza stone. To use your wood plank or pizza stone, set up your grill with the three zone set up then place your food in the middle section (away from the fire). Plank Cooking (Planking) — The plank wood infuses your food with the wood’s natural oils and moisture. Different types of wood create a different taste. Before you cook on the wood plank, submerge it in a water pan and soak it for at least 30 minutes before putting it on to your grill, otherwise it will leave a strong burnt taste or may even catch on fire. Planks are typically used for salmon and wild meats, but they can also be used for other types of food as well. Pizza Stone (Baking Stone) — Pizza stones are typically made out of ceramic or fired-clay. They can withstand high temperatures, and they recreate the conditions of a brick oven on your grill. The stone absorbs the heat from below and transfers it to your food to cook it evenly. 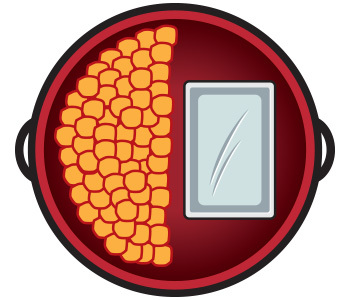 The stone also pulls in moisture from your pizza or bread, leaving it with a crackling gourmet-style crust.Using different grilling methods can add another dimension to your grilling technique. Do you have a favorite recipe that uses a direct or indirect method, or even a combination of both grilling methods? Share it with us in the comments below!